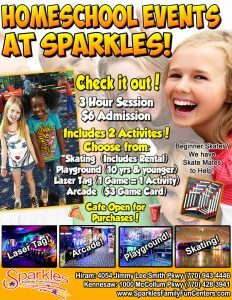 Sparkles is the place to be for homeschool events in Hiram and throughout west metro Atlanta! From play groups and field trips to holiday parties and socials, we make it easy and affordable to get kids together for fun in a safe, family-friendly environment. Our family entertainment facility is convenient to Hiram, Dallas, Powder Springs, Clarkdale, Austell, Mableton, Lithia Springs, and Douglasville, so book your homeschool event today! Contact us online or call us at 770-943-4446. Wondering what’s included in our homeschool event packages? They come standard in 3 hour sessions with $6 admission, which includes 2 activities! 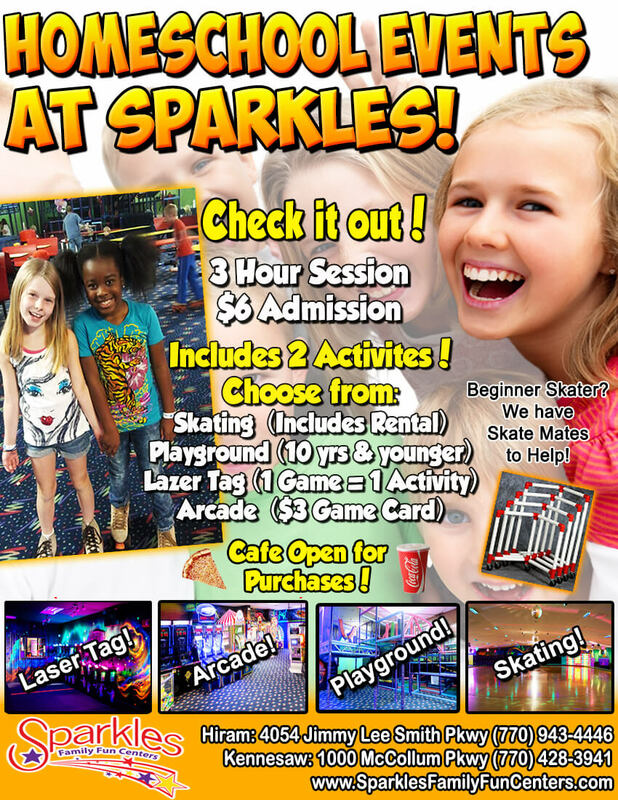 Choose from roller skating (skate rental is included), our awesome indoor playground for kids 10 years old and younger, laser tag in our super cool 2-story, 3-D blacklight arena (1 game counts as 1 activity), or our arcade full of beloved classics and exciting new games ($3 game card). Our cafe will be open so everyone can refuel with a tasty snack after working up an appetite out on the skating rink or battling it out in the laser tag arena. If your attendees are new to skating, not to worry! We have handy-dandy “skate mates” on hand to help new skaters get the hang of it. If you have another type of event in mind, don’t hesitate to let us know! In addition to our homeschool event package, we also host a variety of private and public events. You can rent out our whole facility for your special occasion, from homeschool prom to mixers to team parties, and much more.